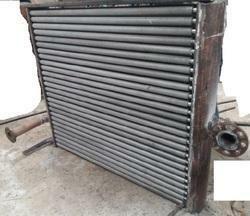 Our product range includes a wide range of heat exchanger for oil mills. We are the leading manufacturer of Heat Exchanger for Oil Mills using Aluminium Extruded finned tubes. Compared to other types fins do not break, unwind or become loose. It gets tightly mechanical bonding with the base tube. There will not be anu air gap between the fin and the tube. It leads to 100% heat transfer efficiency.